Maybe I like walnuts so much now because I named my dog Walnut. He’s fluffy, kind of walnut in color and my home office sidekick. I mean, who wouldn’t love him? And who doesn’t love walnuts? They’re the perfect nut. Subtle, fatty, crunchy and they come in a handy dandy carrying case that can withstand even the bumpiest travel. My Mom thinks that eating 2 oz of walnuts a day will make her lose weight. I think playing with Walnut 10 minutes a day will make me lose weight. Not sure who’s more accurate in their walnut assessment, but I’ll leave it at that. Also, today is Passover. Yay! Time for matzo! Time to re-open the box of matzo I bought for last year’s Passover. Because I never finished it. Why? Because I am a bad Cashew (Translation: Catholic + Jew = Cashew). Because I have an other worldly desire for bread. Because I share my home with another bad Cashew and a Walnut. Oh, and why, you’re wondering, did I keep that box of matzo around for so long? Because I’m a good Jew…can’t throw away my precious dollars. Plus, it’s not like it doesn’t keep. I should just stockpile now for the rest of my life, just in case a freak tsunami overtakes Hancock Park. You can, if you like, use matzo for purposes other than eating. I hear it makes a good dry wall. I digress. We were talking about walnuts! 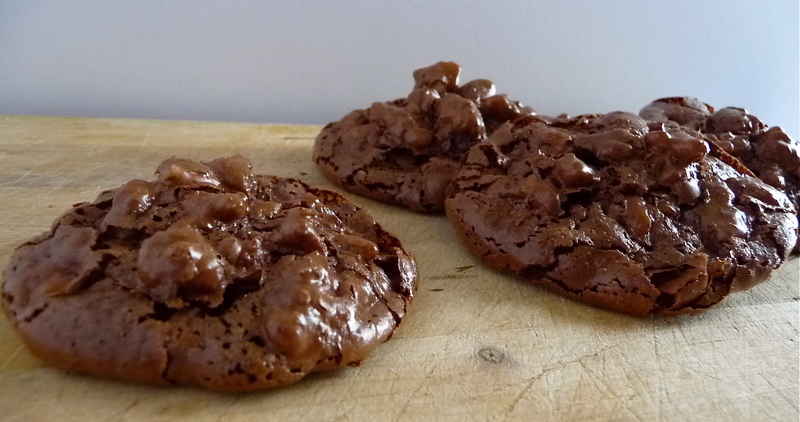 So let me show you the Flourless Chocolate Walnut Cookies I made today for our Passover seder tonight. Recipe courtesy of Smitten Kitchen, by way of Francois Payard. Preheat oven to 350. Spread the walnut halves on a large-rimmed baking sheet and toast in the oven for about 9 minutes, until they are golden and fragrant. Let cool slightly, then transfer the walnut halves to a work surface and coarsely chop them. Position two racks in the upper and lower thirds of the oven and lower temperature to 320. Line two large-rimmed baking sheets with parchment paper. In a large bowl, whisk (or combine in an electric mixer on low speed) the confectioner’ sugar with the cocoa powder and salt followed by the chopped walnuts. While whisking (or once you change the speed to medium), add the egg whites and vanilla extract and beat just until the batter is moistened (do not overbeat or it will stiffen).